CHICAGO, Oct. 8, 2017 /PRNewswire/ — It’s that time of the year again. Quaker® Oats is ringing in Oatober, a month-long celebration dedicated to the nutritional power of the oat. As an extremely nutritious food, containing nutrients valuable to good health, oats are a grain to celebrate all month long. This year’s Oatober brings together regions from around the world to celebrate how oats can supercharge breakfast by adding powerful nutrition and endless combinations to the morning. Countries around the world are marking Oatober, with events, in-store activations and working with local digital influencers, in addition to traditional print and digital advertising. From heart health and satiety, to digestive health and energy benefits, consumers will hear about the many ways oats nourish. These benefits include adding fiber (including the soluble fiber beta-glucan), vitamins and minerals to start the day. To bring the nutrition-forward message to life, Quaker is holding a number of activations around the globe where different regions will showcase the nutritional power of the oat. In India, an influencer program focused around the “Breakfasts of India,” will reinforce oats’ nutritional punch, while Quaker Feed a Child will #MakeFestivalsMeaningful by encouraging people to pledge a fistful of nutrition to children across the country. Brand ambassador and Michelin star Chef Vikas Khanna will also champion the Oatober movement through digital activations. In the United Kingdom, porridge season will include a focus on nutrition, in addition to the traditional emphasis on taste and comfort, with a digital program that includes partnering with health and wellness influencers to create unique and engaging content. In São Paulo, Brazil Quaker will open the doors to The Oatery, an immersive gastronomic experience that brings the nutrition of the oat forward in partnership with renowned Brazilian chef Morena Leite. In more than 4,000 stores around the United States, consumers can find Oatober in the store aisle, with the launch of a new retail campaign which will provide 31 days of inspiration through oat-based recipes. For more information, please visit www.Oatober.com. You can also follow the company’s Oatober celebrations by searching for #Oatober on social media. The Quaker Oats Company, headquartered in Chicago, is a unit of PepsiCo, Inc., one of the world’s largest consumer packaged goods companies. For more than 135 years, Quaker’s brands have served as symbols of quality, great taste and nutrition. 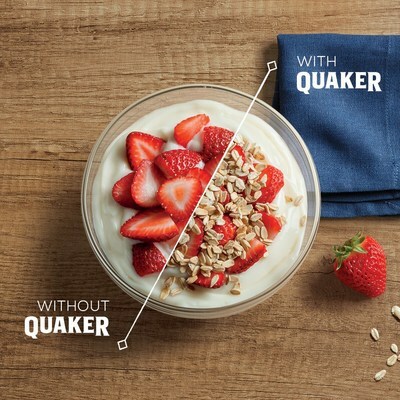 For more information, please visit www.QuakerOats.com, www.Facebook.com/Quaker or follow us on Twitter @Quaker. PepsiCo (NYSE: PEP) products are enjoyed by consumers one billion times a day in more than 200 countries and territories around the world. PepsiCo generated approximately $63 billion in net revenue in 2016, driven by a complementary food and beverage portfolio that includes Frito-Lay, Gatorade, Pepsi-Cola, Quaker and Tropicana. PepsiCo’s product portfolio includes a wide range of enjoyable foods and beverages, including 22 brands that generate more than $1 billion each in estimated annual retail sales.